A request of solidarity from our member group Boulevard Neighbourhood Watch…..
Detectives investigating the murder of Shaun Lyall in Cleethorpes have obtained new photos of the man we want to find in connection with his death. Shaun’s body was found at an address on Sidney Street on Tuesday 17 July 2018. We have been looking for 28-year-old Abdi Ali who is a significant suspect in the investigation and can now release brand new images of him. Throughout our appeals Abdi Ali was known for a having a distinctive gold tooth at the front of his mouth. These latest images taken on Saturday 30 June 2018 were recovered from a mobile phone and clearly show him with a missing front tooth. This confirms that he has had the gold tooth removed. Detective Inspector Becky Dickinson from Humberside Police’s Major Crime Team who is heading up the investigation said: “These photos corroborate the information we have from our enquiries about Abdi Ali’s appearance. “Our search for the main suspect in this murder investigation has taken us countrywide, and we have made extensive enquiries into his background, associates, and lifestyle. 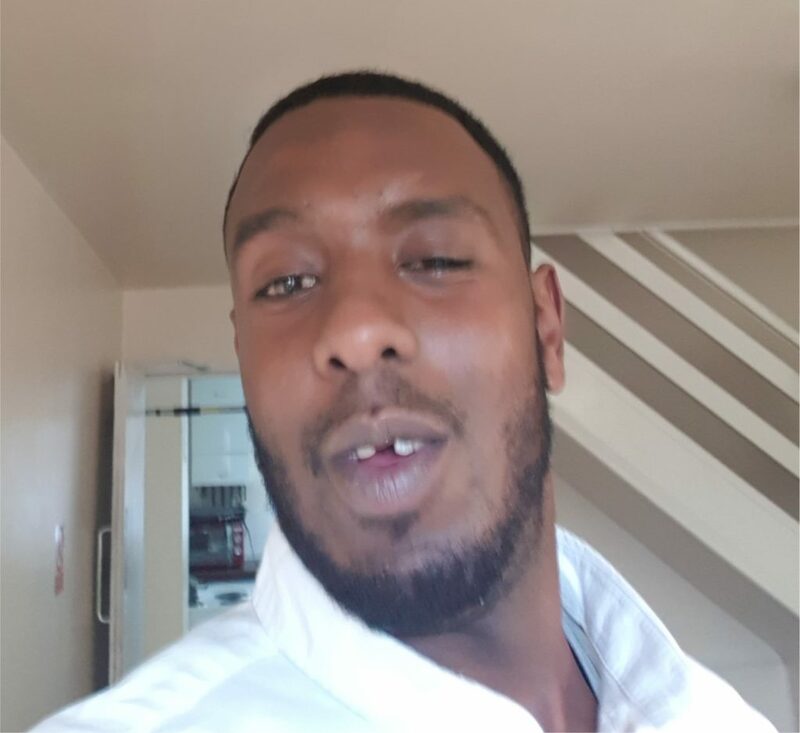 “We know that Abdi Ali is a habitual drug user, and we know he has links with the Somlaian communities in Sheffield and London where he has family connections. “He also has connections in Lancashire, Merseyside, Manchester, Milton Keynes, Lincolnshire, and Cleveland. “More lines of enquiry have opened up recently which we are pursuing in our continued search for him. “It is clear to me that someone is helping or hiding Abdi Ali. I want to remind that person or people that in doing so they are too committing a crime. “I want to appeal to the public not to approach Abdi Ali as he can be a dangerous man when confronted. Call the police first. “The murder of Shaun Lyall was a heinous crime, and we have been working closely with his family and providing support to them through what has been a very difficult time. You can call 101 or 999 if it is an emergency. Also you can use the independent charity Crimestoppers if you want to remain anonymous. They are on 0800 555 111. A £5,000 reward is still being offered by Crimestoppers to anyone who can give information to their charity about Abdi Ali’s whereabouts. Information can also be given via their anonymous online form at Crimestoppers-uk.org.